Polish and Ukrainian Wichlacz factories specialists have been producing more than 28 years the steam and water-heating solid fuel boilers. They have great experience in refitting boilers (gas, diesel, fuel oil, etc.) for solid fuels. 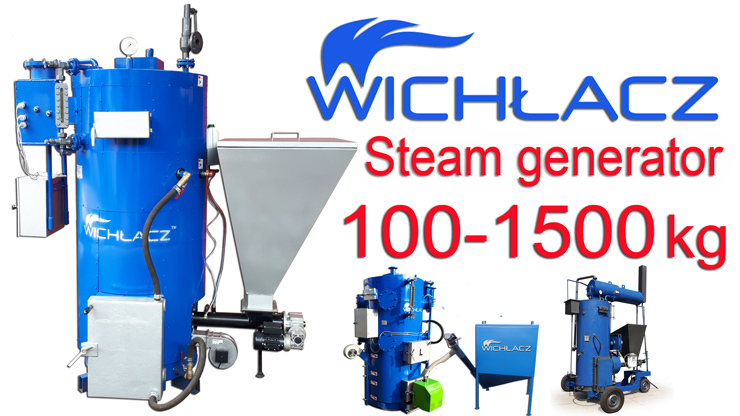 Wichlacz factories has many patents for its engineering (boilers and burners innovations), which haven’t analogues in the world. 1) Steam generators with manual fuel loading, for working on any solid fuel of large sizes, and combustible production waste. 2) Steam generators with automatic fuel supply fraction of up to 30 mm., (Coal, wood chips, peat, pellets, etc.) with retort burners. 3) Steam generators with automatic fuel supply fraction from 1 to 100 mm. (coal, wood chips, peat, pellets, etc.) with vortex burners – Biopalnik. 4) Automatic steam generators with auto ignition pellet burner, for working on different types of pellets: wood, agropellets, pellets from sunflower husks, pellets from different husk, etc. 5) Mobile solid fuel steam generators on the wheelbase, for quick movement between objects. + We produce a range of Economizers - devices designed to extract heat from the flue gases of boilers and generators. It has potentiality to increase equipment productivity by 10-15% for all of our steam generators.